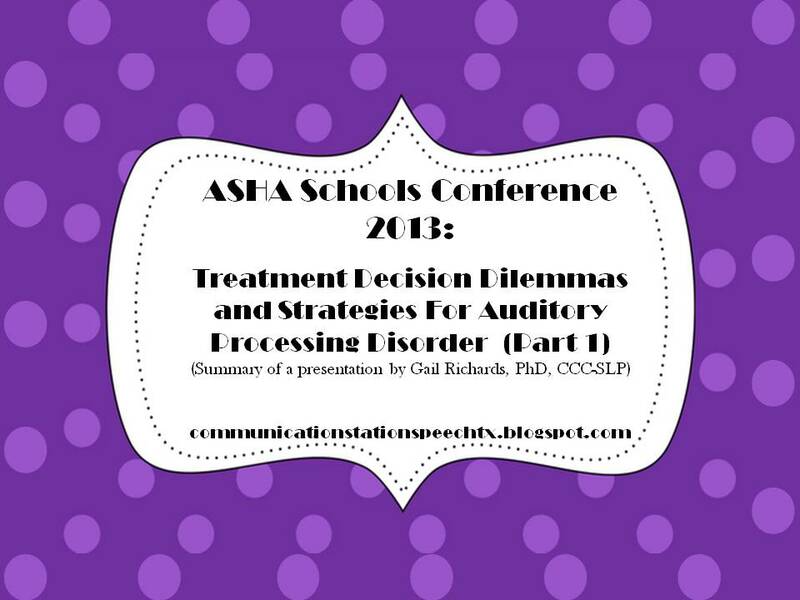 ASHA Schools Conference 2013: Tx Decision Dilemmas/Strategies for APD: Part 1-Assessment! Gail Richard, PhD, CCC-SLP, presented on Treatment Decision Dilemmas and Strategies for Auditory Processing Disorders (APD) in July at this year’s ASHA schools conference. Below is a recap of what I found interesting and important to share from this presentation. I broke this up into two blog posts. This is part one, focusing on assessment of APD! 1. APD and CAPD are synonymous. 2. SLPs need to work together with audiologists to understand audiology in terms of APD AND to effectively treat students. 3. Many times we are hearing psychologists, teachers, neurologists label student with “processing problems”, however we need determine if the student truly presents with signs or symptoms of APD and make appropriate recommendations. 5. As SLPs we need to be able to discriminate which processing skill(s) are weak and which are strong so we can create an effective treatment program. 6. Problem with determining correct diagnosis and creating effective treatment plans is that APD can be comorbid with deficits in: phonological awareness, auditory attention, and auditory memory. 7. Also the fact that there is little consensus on a standard definition of APD by various professionals affects diagnosis. 1. Deficits under definition of APD are so encompassing there are a number of assessment tools that should be used to make an appropriate definition. 2. Dx of APD should NEVER be made based on one single test or subtest! 3. Even within assessment instruments there is not agreement on performance, therefore ASHA recommends that performance of at least 2 SD (standard deviations) below the mean on 2 tests be the minimum to obtain a dx of APD. 1. Auditory perception skills play a vital role in literacy as if a child cannot perceive a sound, he/she will struggle to read that sound therefore it is VITAL to work on auditory perception skills. 2. Previous belief that we need to work on auditory perception before language is not effective. Therefore we SHOULD be SIMULTANEOUSLY working on auditory perception AND language skills. 3. We also need to determine if audition or amplification must be put in place in order to improve auditory perception skills. 4. Determining if there is an underlying language deficit rather than auditory perception skills deficit is a must as it will determine the course of treatment. 2. SLPs should test phonemic and language processing skills as well as executive functioning skills. -Can the student hear it? -Can the student repeat it? -What is the 1st sound? -What if I repeat multiple times? -What if I say it slower? -What if I say it louder? I hope you enjoyed part 1 of this presentation. Come back next week for part 2 where treatment of APD will be discussed! Tip Tuesday: Can We as SLPs work on Memory? Spotlight on All Y’all Need: Smiley Smellies!